ELHistSoc -Veterans Social Club 1955 Softball Championship. Veterans Social Club 1955 Softball Championship. There was a city Softball League in the 40's and 50's in East Liverpool. They played at the old YMCA ball field on Bradshaw Ave. Some of the teams in that league were the American Legion, Winland Glass Company, VFW Post 66 and Veterans Social Club. The Veterans Social Club won the city championship at least once. Playing first base for that championship team was Bob Boston. At second base was Alonzo Spencer. Playing Shortstop was Ted Spencer with Oliver Spencer playing Third Base. Catcher was either Helick Pack or Tony Williams. Left Field was John D. Jackson Center Field was McKinley Pack with Charlie Hays in Right Field. Pitchers were Doggie Jerrick and Floyd Robinson. 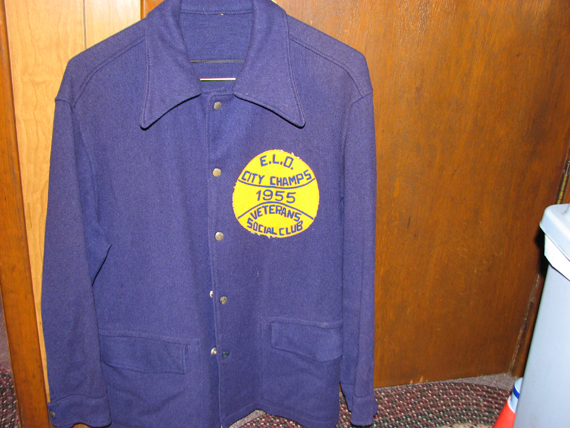 Alonzo Spencer's Championship Jacket. Picture courtesy of Alonzo Spencer.